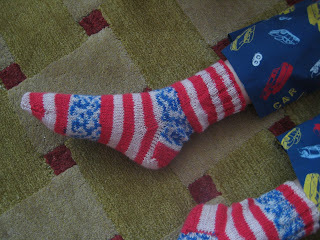 The yarn is Fortissima Socka Stars and Stripes. I saw a sample in Yarndogs and just knew I had a willing recipient for socks like this. The yarn was a little rough to knit - not really course, but compared to Step for example, not as nice to knit. After a wash it softened up nicely. The pattern is my usual recipe with a k2p2 cuff.